Cinderella is a 2015 fantasy and romance film from director Kenneth Branagh and writer Chris Weitz. Released by Walt Disney Pictures, the film is based on Walt Disney's 1950 animated feature film, Cinderella, and the folk tale of the same name. In this new version of the story, a young woman is at the mercy of her cruel stepmother, but her fortunes change after she meets a dashing young man. In a peaceful kingdom there is a father (Ben Chaplin), a mother (Hayley Atwell), and their beautiful daughter, Ella (Lily James). Ella's parents teach her courage and kindness, and her mother teaches her to believe in magic. Some years after her mother dies, Ella's father marries the Lady Tremaine (Cate Blanchett), who has two loud, rude daughters, Anastasia (Holliday Grainger) and Drisella (Sophie McShera). When Ella's father goes abroad for business, Lady Tremaine reveals her cruel and jealous nature. After Ella's father dies, Lady Tremaine takes over the household and pushes Ella from her own bedroom and into the attic. Anastasia and Drisella even give Ella a new name, Cinderella. After one particularly cruel day, Ella rides off into the woods where she meets a young man who says his name is Kit (Richard Madden). For both young people, this meeting is a turning point, but there are forces arrayed to keep them apart. At the end of this movie, the Fairy Godmother (played by Helena Bonham Cater) describes the “forever-after” as being defined by “courage,” “kindess,” and “a little magic” (or something like that). This live-action version of Cinderella is indeed about “just a little magic.” Disney's classic, 1950 animated Cinderella is a fairy tale that is practically entirely infused with magic – from talking animals to an atmosphere of enchantment. Cinderella is more like a fantasy-romance or a romantic fantasy than it is like a fairy tale. With its lavish costumes and opulent sets, Cinderella plays like a period set piece set in a fictional kingdom in an indeterminate time. But I can move past that. 2015 live-action Cinderella does not have to be 1950 animated Disney classic Cinderella. This new Cinderella relies on its title character for the magic that a wand or a fairy godmother might provide. 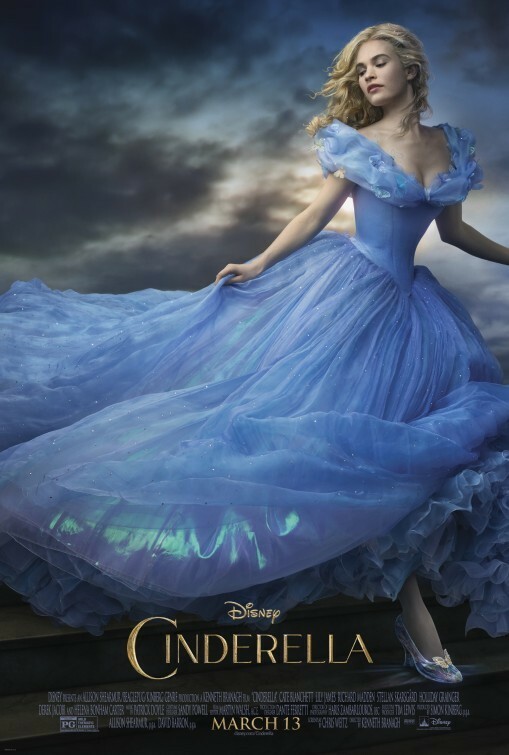 As Cinderella, Lily James is quite good. When she smiles or is happy, the movie lights up. When she is sad, I felt sad, too. In this film, James does not have the greatest range between happy and sad. When Cinderella isn't happy or sad, James makes her look as if she is in a solid state of consternation. Luckily, it is Cinderella's state of happiness or sadness that drives the movie, and that works. I don't need to say that Cate Blanchett is really good as Lady Tremiane, “the Stepmother.” Blanchett dominates her scenes, and the filmmakers were wise to limit her screen time; otherwise, Blanchett would have burned this movie down in a larger roll. Everyone else is good enough to pretty good, although Stellan Skarsgård seems neutered as The Grand Duke. Of course, there is not enough of Nonso Anozie as Captain of the Guards, but I am glad that this film's decision-makers were willing to cast him. Cinderella is not for everyone. It is sweet and cute, a feel-good movie that goes down like warm hot chocolate on a cold winter's night. Cinderella is a good, but not great film, and director Kenneth Branagh does nothing to distinguish himself here. But there is enough Disney magic here to entertain some of us. The text is copyright © 2016 Leroy Douresseaux. All Rights Reserved. Contact this site for reprint or syndication rights and fees.